TerrainControl is an advanced world generator. Through various configuration files it gives the user control over almost every aspect of Minecraft terrain generation, with no knowledge of Java required. It can be used on Bukkit or Forge servers and on singleplayer with Forge. TerrainControl is the successor to the old PhoenixTerrainMod, which was based on the popular BiomeTerrainMod. As of Terrain Control 2.4.13, the plugin sends some stats to mcstats.org, a service by Hidendra and others. You can view the stats here. Terrain Control won't upload your configs, it will only send your BiomeMode along with some information of your computer. You can toggle it off by setting opt-out to true in the metrics config file. More information is available on this wiki page. Also check out the showcase thread in our forums! 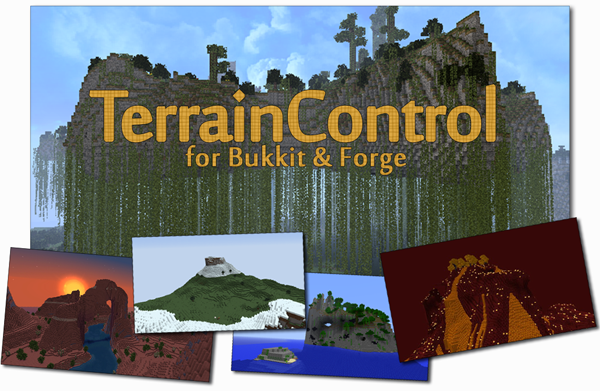 TerrainControl is more complex than most Bukkit plugins, so it may take a while to get into - but the results are worth it. If you want to create your own world, be sure to check our documentation. If you have done some reading and still have problems using TerrainControl, just post to our forums and we'll try to figure it out. BO3-Tweaks by Elzaar and LanToaster. Command-line application to tweak BO3-objects. BiomeEdit.py to edit biomes side by side. You'll always find the newest approved stable builds here. As of 2.4, the files will work on both Bukkit and Forge servers (without the need of something like MCPC+) and on singleplayer with Forge. Installation instructions can be found here. You can find all user-created world configurations, biomes and custom objects that are currently available here. Important - please do not post your questions in the comments section below, head to the forums instead! We do not answer questions here as it would only result in chaos. Feel free to use the wall for general comments! can this work with a multimc launcher on single player? I am attempting to make a single biome based world but everyone says use mc edit, which doesn't work the way i need it to do. I tried Terrain control and apparently am unable to figure this out any further. The bukkit server does not show the graphics (color of sky, water, plants). "An internal error ovvurred when attempting to perform this command." I installed the plugin correctly when i do /pl it shows up there. Same here. Doesn't work at all. For everyone having trouble running it in single player, there is a very simple solution - don't try. Run a local Bukkit server from your console like I do (you can just follow the instructions on the Bukkit wiki - works fine on Windows 8 with the latest Java version) and just treat it like any other SMP server. People on your local network will be able to access it just the same, and you can install any plugins by placing them in the 'plugins' directory without trying to locate a single player build. If plugins you use require a MySQL database, just install something like XAMPP or WAMPP and move on with your day! I am having a major issue on my server maps, terrain wont generate after 4k, after that its all open ocean. I installed this as it is meant to over ride the vanilla configs but when i run the server, while it generates the TerrcainControl file in the server directory, there are no files generated inside it. I have my server.properties set from DEFAULT to TerrainControl but other then making the directory nothing happens. Im running FTB Mindcrack V8 so not sure if its a compatability issue with extra biomes. If it is, is there a fix to get over the vanilla land generation bug? 200+ maps and none have land at 7k radius from spawn point. Looks sweet! Definitely going to download! This is awesome, I'm going to download it. I know! Im having issues too. Ive never used it before, but I follow the directions exactly all I get is a crash report. It must be something to do with the newest update. Someone needs to do a video tutorial on how to use the SSP version. the tutorial linked shows how to use this on a bukkit server, but it makes very little sense regardless. Does anybody understand how to use this, I've found the wiki page on it but I understand it very little. Could somebody help me set it up on a server please.